Mitochondria generate energy through oxidative phosphorylation and the production of ATP, and mitochondrial function is critical for tissue health. The heart is especially dependent on mitochondrial processes, and perturbation of mitochondrial homeostasis is a contributing factor to several cardiac diseases. Xudong Liao and colleagues at Case Western Reserve University School of Medicine demonstrated that the transcription factor Kruppel-like factor 4 (KLF4) regulates several transcriptional events that promote proper mitochondrial function and autophagic flux in cardiomyocytes. In a mouse model, induced cardiac-specific deletion of Klf4 in adult animals led to reduced myocardial ATP levels and diminished myocardial function both in response to pressure overload and during aging. Additionally, loss of KLF4 resulted in reduced mitochondrial respiration rates. Induced Klf4 deletion in cardiomyocytes of embryonic animals disrupted mitochondrial biogenesis and maturation, resulting in cardiac dysfunction and 50% mortality within 2 weeks after birth. Liao and colleagues determined that KLF4 works in a complex with the PGC-1/ERR transcriptional module to promote expression of genes that regulate mitochondrial development and function. Finally, KLF4 was shown to regulate transcription of the autophagy genes Ulk1 and Ulk2 and thus promote proper clearance of damaged mitochondria. Collectively, these data implicate KLF4 as a critical regulator of mitochondrial function that maintains the health of cardiomyocytes. 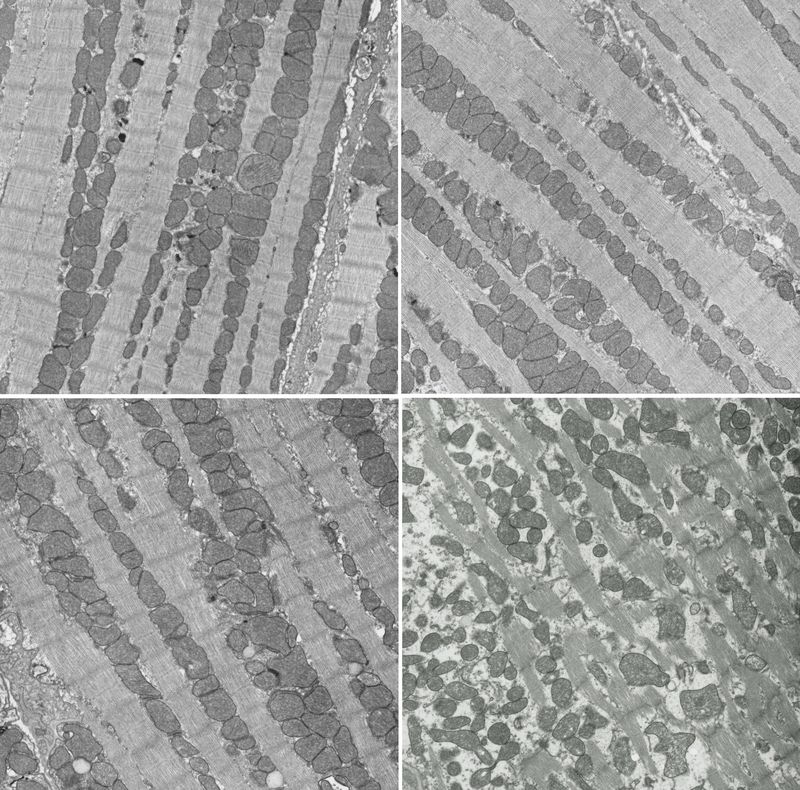 The accompanying transmission electron microscopy (TEM) image shows myocardium from control animals (left panels) and from mice with cardiac-specific Klf4 deletion (right panels) at baseline (top) and following pressure overload (bottom). Note that loss of KLF4 leads to substantial mitochondrial damage under stress conditions.